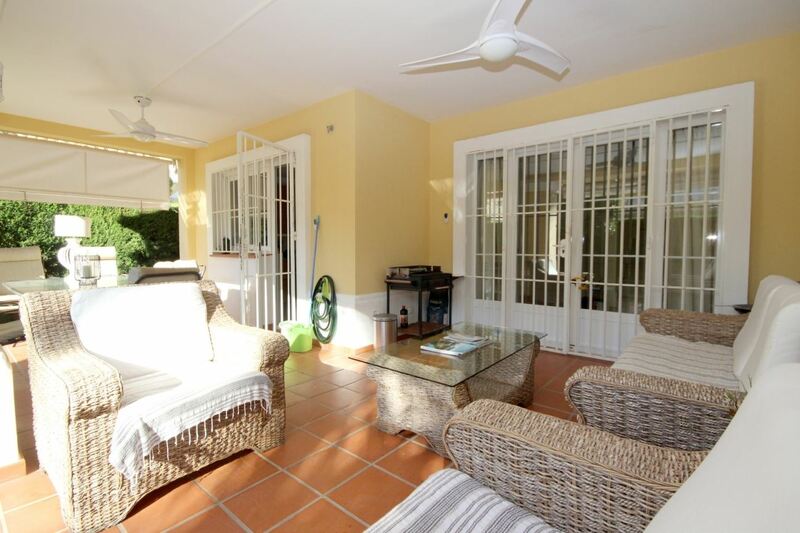 Wonderful town house for rent in the heart of Elviria. Lovely property located besides the Santa María golf course, in one of the most enchanting gated complexes in Elviria; now available for rent short term. This property has everything you need to enjoy your stay in Marbella, at only 15 minutes walk from the Commercial Centre of Elviria, 20 minutes walk from the lovely Elviria beaches and 15 minutes by car from the Marbella old town centre, you can enjoy a peaceful stay without having to be far away from the fun. The town house is fully equipped with everything you may need during your stay. A fully fitted kitchen and an ample living room with fireplace in the main floor, with direct exit to a large covered terrace with garden; and 2 guest bedrooms, a bathroom and a master bedroom with en-suite bathroom and balcony takes up the top floor. One of only ten townhouses in this safe gated complex with 2 allocated parking spaces in its private driveway and lots of parking space on the street. Dont hesitate to contact us if you need further information. This townhouse is also available for longer periods.